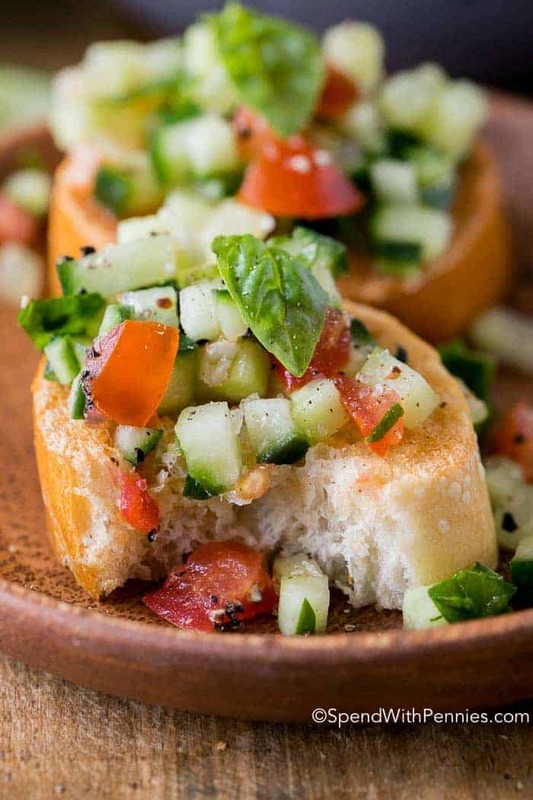 Cucumber Bruschetta is a fun twist on a traditional favorite! Fresh crisp cucumbers tossed with juicy tomatoes and combination of garlic, basil and olive oil make the perfect topper for a crisp garlicky toasted baguette. 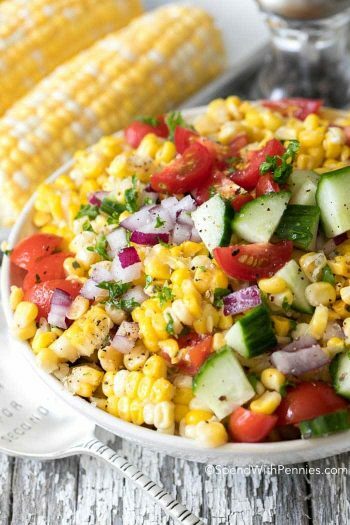 This quick, easy recipe is perfect as a side dish, an appetizer or simply as a snack. One if the things I love best about summer is sitting around with friends on the deck enjoying snacks and sunshine. 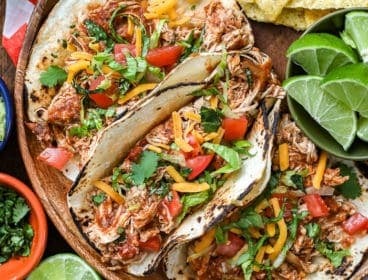 If it’s hot out, I try to serve foods that are both fresh and delicious (and I love any excuse to use herbs and veggies from my garden)! 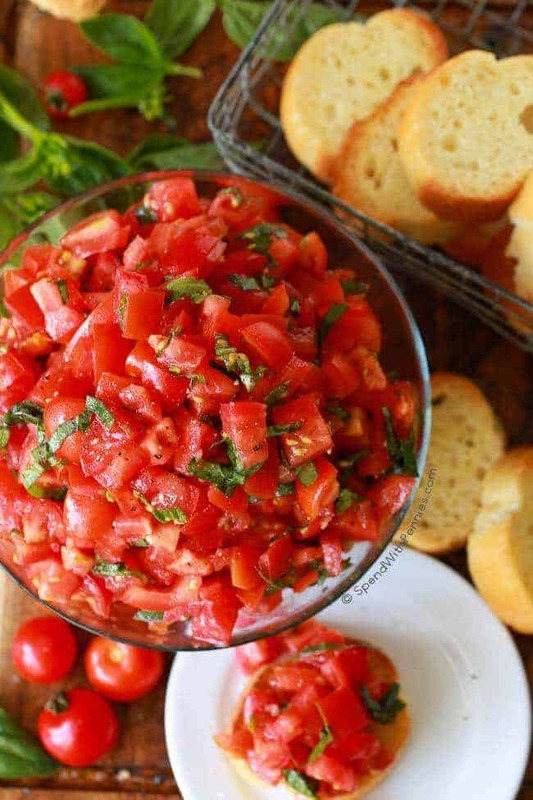 A traditional tomato bruschetta is one of the snacks I make most when the sun is shining. 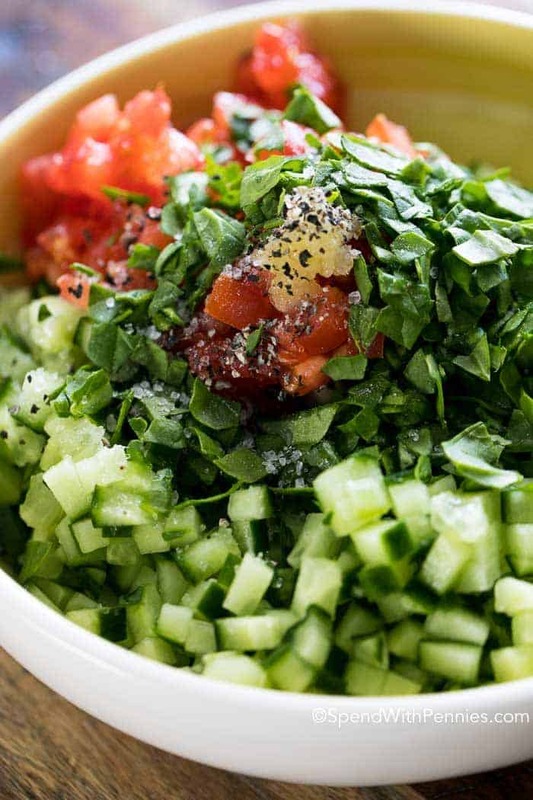 The delicious combination juicy summer tomatoes tossed with garlic and fresh basil just can’t be beat! 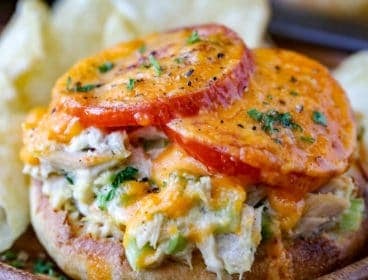 While I love a traditional bruschetta, I sometimes sub out the bread and top cucumber slices with my tomato bruschetta topping for a fresh and light crunch. 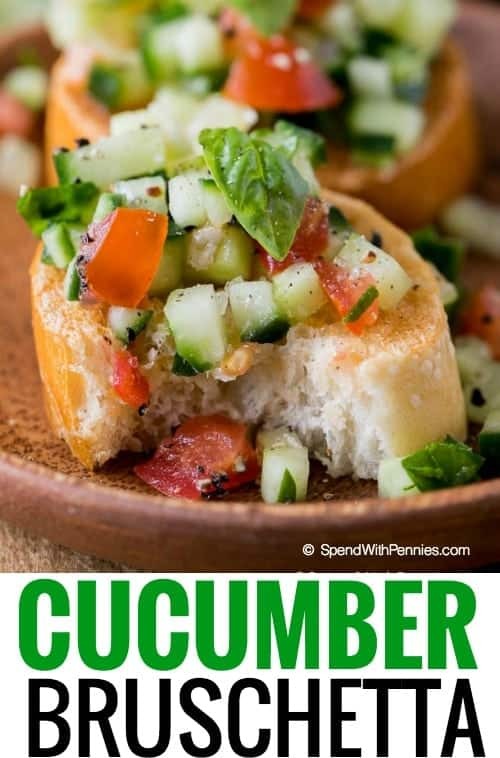 While these are both very tasty options, this Cucumber Bruschetta recipe is a delicious combination of the two! I can’t tell you how much bruschetta I ate when I visited Italy, but it was a LOT (at least once every day)! 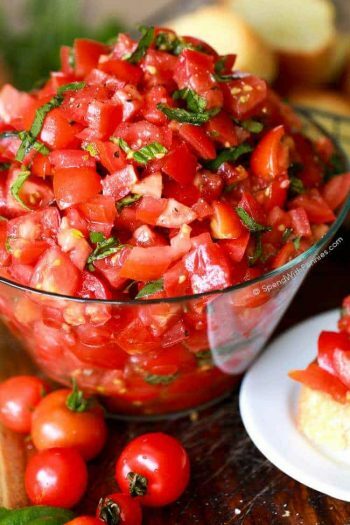 A lot of people think that the ‘toppings’ (the typical tomato mixture) is the bruschetta, but it isn’t! 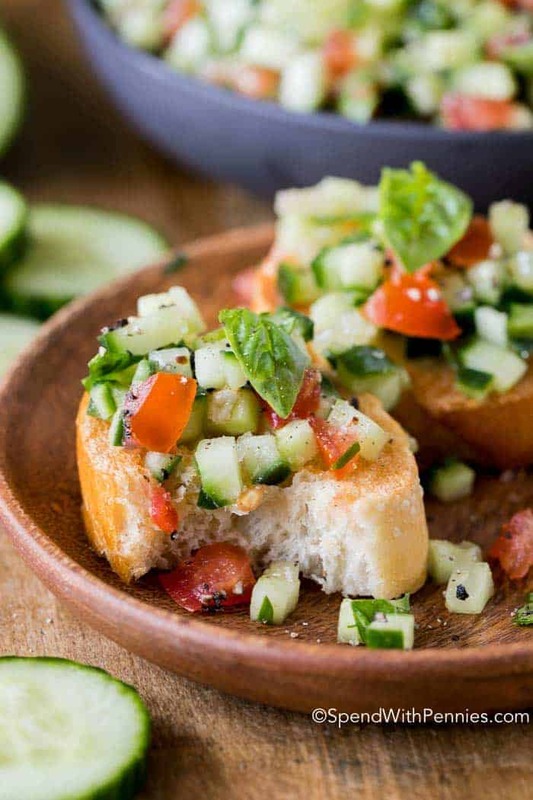 The bruschetta is the lightly toasted bread with olive oil and rubbed with garlic. 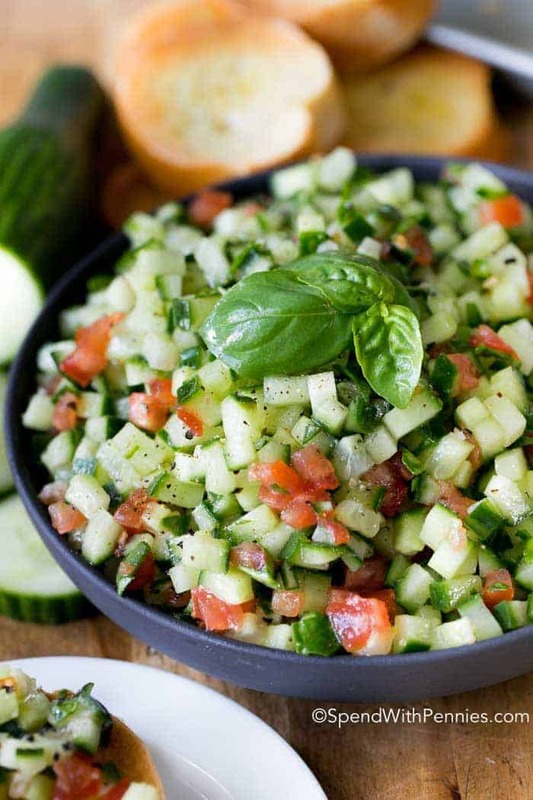 While tomato is usually the main player in a traditional bruschetta topping, you can top a bruschetta with anything; cucumber takes main stage in this recipe. 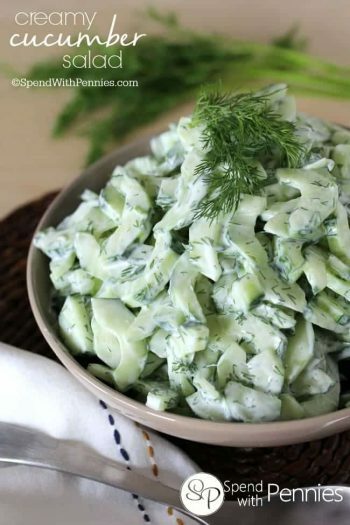 I find that a long English cucumber works best for this recipe because the seeds are small, it is less watery and has a thinner skin. 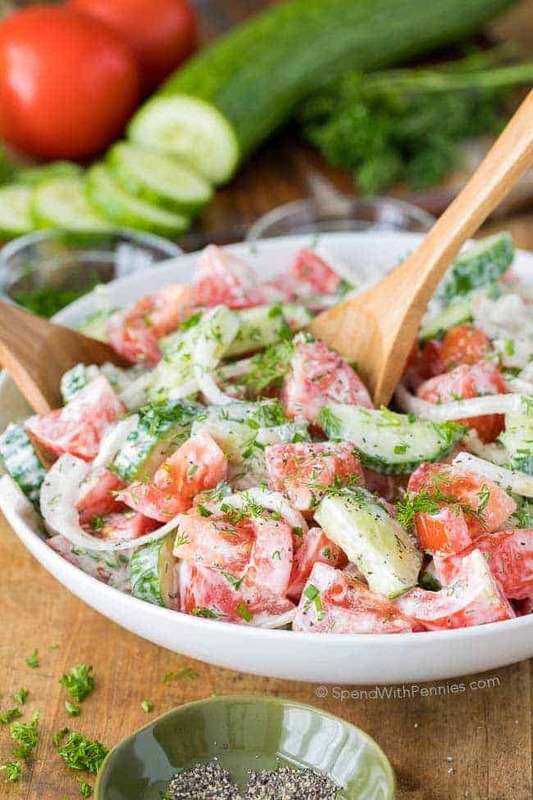 Since I love the combination of cucumber and tomato so much, I add a little bit of diced tomato to this recipe too. You can use any variety, I usually just choose what is best at the store or use cherry tomatoes from my garden! 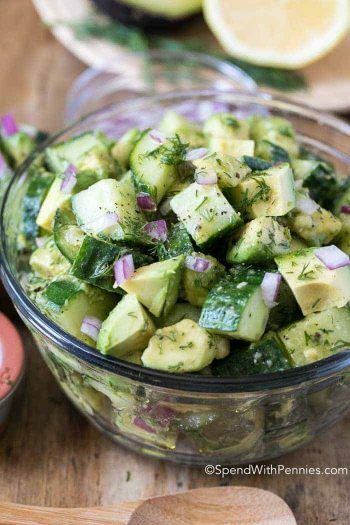 Combine these two delicious veggies with aromatic garlic, fresh basil and red wine vinegar and you have an amazing flavor combination like no other! 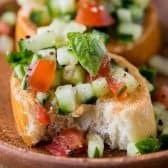 If you are looking for a delicious snack or need fresh summery appetizer to serve when friends come over, this Cucumber Bruschetta is amazing. 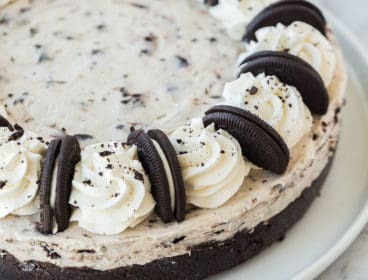 Everyone loves it because it is unique (yet the flavors are familiar), and it’s so incredibly delicious. 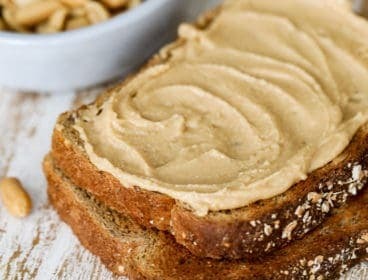 To top it off, this recipe is so easy to make and to transport. 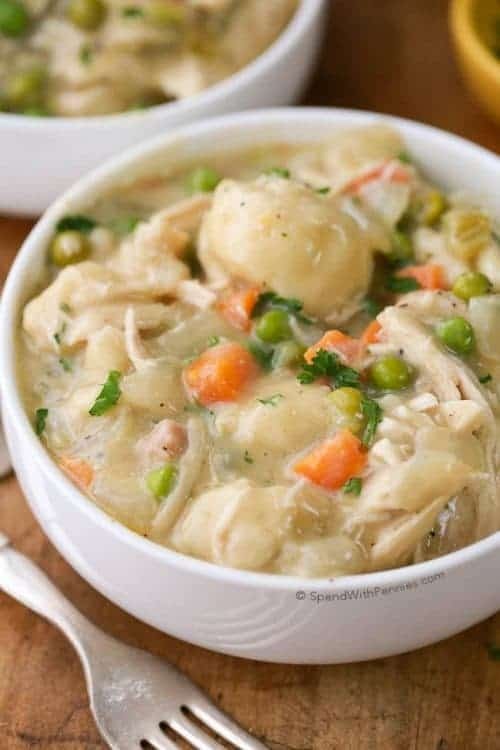 Be sure to wait until just before serving to top each piece of bread with the vegetable medley as the juices do run into the bread and if left too long it will become soggy. 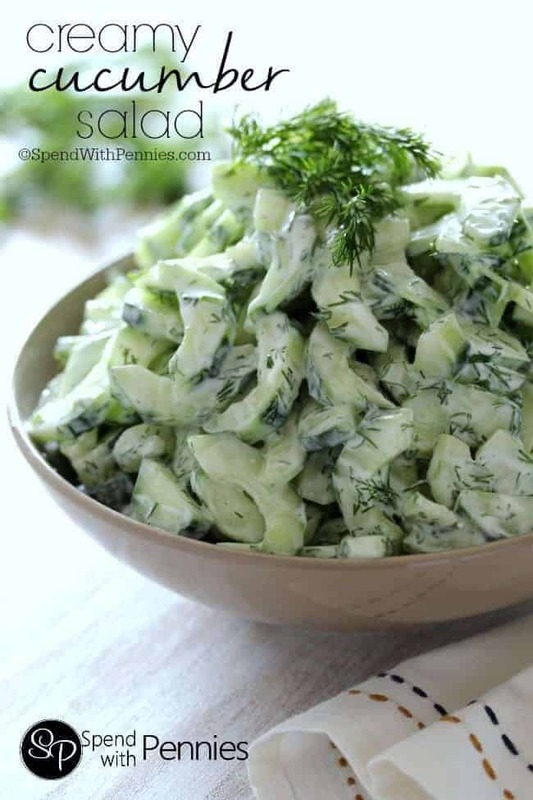 When serving this to a crowd, we most often place the cucumber mixture in a bowl and the toasted bread on the side and let people dish it up as they like! 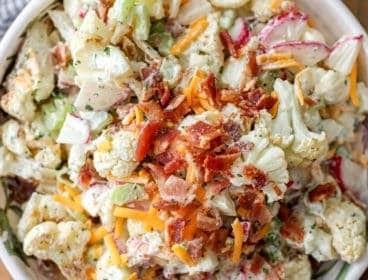 While I serve this topping on bread, you can serve it along with crackers or even use it to top grilled fish or chicken for a fresh summer meal! A fresh and delicious appetizer loaded with flavor. 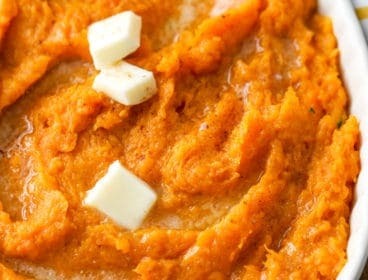 Add all topping ingredients in a bowl and gently toss to combine. Slice baguette into 3/4" slices and brush the top of each slice with olive oil. Broil 2-3 minutes or until lightly toasted. Remove from the oven and rub each slice of bread with the fresh clove of garlic. 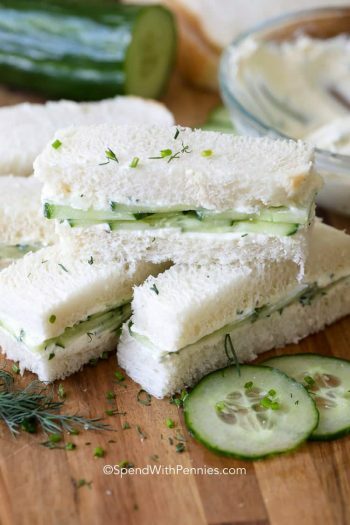 Spoon the cucumber mixture over the bread to serve.